Getting where you want to go can be daunting but these tips should help. “Helpful” signage at an intersection. You can get almost anywhere but you can’t get there from here. The best advice, get a GPS for turn by turn, a good map for the overview, and ask for help early and often – buy our nifty waterproof roadmap with an English/Spanish “asking directions” phrase section printed right on it so they’ll always be handy. Especially off of the downtown street grid, directions from landmarks are often used in lieu of addresses. This is true even on business cards, in the phone book, and in advertising. Don’t try to find something at an Apdo. address; this is not an apartment as the false cognate might suggest, rather it is a post office box. Small town or rural businesses may have an Apdo. address in San José, 100 km from their physical location. If someone is giving you directions “directo, directo, directo” literally means straight ahead but it’s rarely straight. Many place names are shared by multiple locations. It is common to provide a secondary identifier if one is ambiguous. For example, La Fortuna San Carlos is near the town, volcano and lake named Arenal while La Fortuna de Bagaces is 50 km away north of the town of Bagaces. Finally some places have more than one name. The Cuidad Quesada on your map is known to Ticos as San Carlos. Roads in towns are laid out on grids with north south calles (streets) and east west avenidas (avenues)—Roads are numbered sequentially outward from Calle and Avenida Central, with even numbers to the west and south and odd to the east and north respectively. Thus, an address of calle 5, avenida 7 indicates a corner in the north east quadrant of town. Calle 5, avenidas 7—9 indicates a location facing calle 5 between avenidas 7 & 9. Large, reflective (or lighted) modern road signs are a relatively new development in Costa Rica. A couple of years ago the highway department made a big push to add big, clear new signage but many were stolen and sold as scrap metal (last I heard they were trying a new un-recyclable composite material worthless to thieves). Using advertising signs to navigate is a time honored tradition in Costa Rica. It used to be the only way you had any idea how far it was to Tamarindo (or which way to turn at an intersection) was to look for the “Tamarindo Best Western Hotel, 22 km ->” signs. It’s still a helpful technique and in 2017 one credit card company started putting up “Quepos 10km – Se Acceptan AMERICAN EXPRESS” style signs all over the country. The distances seem pretty accurate but the declaration that the card is accepted must be some sort of technique to bring on new merchants because no one in Costa Rica accepts American Express (fees are too high). 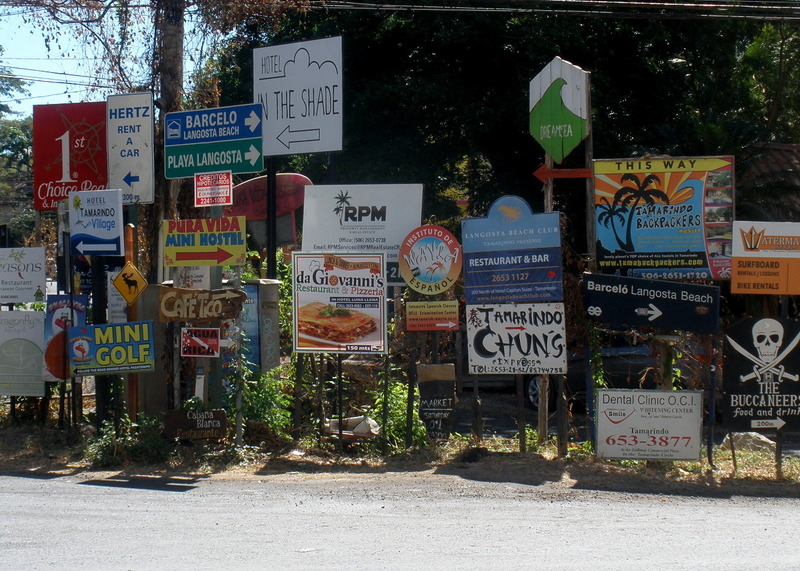 Something to watch out for when navigating by billboards is the misplaced “Welcome To…” sign. Merchants eager to be the first to welcome you to their town have pushed out further and further from the city limits. Street signs in town are becoming more common but in older neighborhoods you may have to look for something written on the side of a building near an intersection and recently they’ve abandoned the sensible old numbered avenidas and calles to introduce a bewildering new array of naming conventions. I don’t recommend navigating purely by following signs. Most places an arrow pointing up on a sign is used to indicate straight ahead. This concept is foreign in Costa Rica where you’re more likely to see a left of right arrow indicating which direction you will turn, or which side of the road the hotel is on after you’ve driven another 15 km straight ahead. After 25 years it still confuses the crap out of me and I take a left at the sign even though I know it’s wrong. In town, 200 meters translates to “two blocks” rather than a measured distance. 250 meters means 2 and ½ blocks not a quarter of a kilometer. In rural areas and on road signs meters and kilometers have their literal meaning. A kilometer is 1,000 meters which is the equivalent of 0.62 miles. I Don’t Care How Far it is, How Long Does it Take? Rural routes and minor paved roads are narrower, have more corners and there are no passing lanes so it’s easy to get stuck behind a mango truck. Figure on averaging 30-45 kph (yes that’s only 19 miles per hour) once you leave the main highways. For the benefit of U.S. citizens, one kilometer is 0.625 miles. 10 miles is about 16 kilometers. Making the exact conversion isn’t necessarily the best approach. As with many things in Costa Rica, the easiest conversion isn’t a conversion but a change of attitude. Just think of kilometers and miles as the same thing. Since the roads are usually narrow and winding it will probably take you at least as long to drive 20 km, than you’d expect for 20 miles. For those who are used to thinking in km, it will take much longer to drive 20 km in Costa Rica than the U.S., Canada or France.